Some Patriots fans lived down to their reputation in the waning minutes of the Patriots’ 43-40 win over the previously undefeated Kansas City Chiefs. 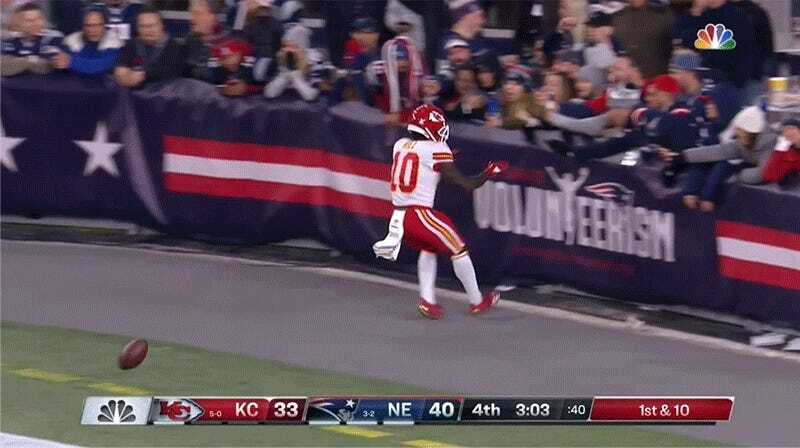 After Tyreek Hill went 75 yards to set up the game-tying extra point, he pulled up in front of the crowd where Pats fans threw beer on him and flipped him off. Update (4:45 p.m. ET): TMZ reports that the fan who threw the beer has been charged.